It’s Spring!! Although there is usually still snow at this time of year in Edmonton, I am buzzing with excitement at how beautiful it is (even though it is a nasty sign of climate change). I started some seeds a few weeks ago and am super excited to see them starting to pop and I can’t wait to start putting them into the ground! The past 2 years I also got milkweed plants to add to the garden. Why? Milkweed is vital for the monarch butterfly population, and helps support other pollinators as well. Monarch butterflies need milkweed to survive – their caterpillars only eat milkweed, and they need it to lay their eggs. Monarch butterflies have been losing numbers drastically, so the David Suzuki foundation launched a campaign to help bring them back. Here are 5 tips for planting milkweed for today’s Five on Friday post! 1 – Know the genus: Asclepias. There are different types of milkweed native to different regions, but they all have the same genus Asclepias. So when you’re at your local garden centre, ask for it, or look for it on the plant tags and you’ll know when you’ve hit the milkweed jackpot! 2 – Find out what’s right for your zone. Different plants will do better in different zones, so you want to ensure you’re getting something that’s right for your area. Monarch Butterfly Garden has a great resource with different types of milkweed, where they can grow, and where they are native. One milkweed plant isn’t going to do a ton – imagine you’re a monarch butterfly looking for milkweed. It would be tough to zero in on one plant! If you can, plant a few plants. Or – plant one, and then collect the seeds to plant more. The best time to plant seeds outdoors is in the fall. Or you could start the seeds indoors and get them ready to plant next spring. This brings us to #4. 4 – Know how to get the seeds. Stewardship Garden has a really awesome step-by-step guide for when to collect seeds from your existing milkweed plant and how to plant them! I was able to harvest seeds from my plants – and it’s so easy to do. The best part about growing things is that you never know what’s going to happen – it’s a new adventure every time! I haven’t gotten any monarchs in our backyard yet, but I only have a few plants, so I’m definitely going to be harvesting seeds this season. I’m excited to see how more milkweed brightens up our yard and when the monarchs will start to come! 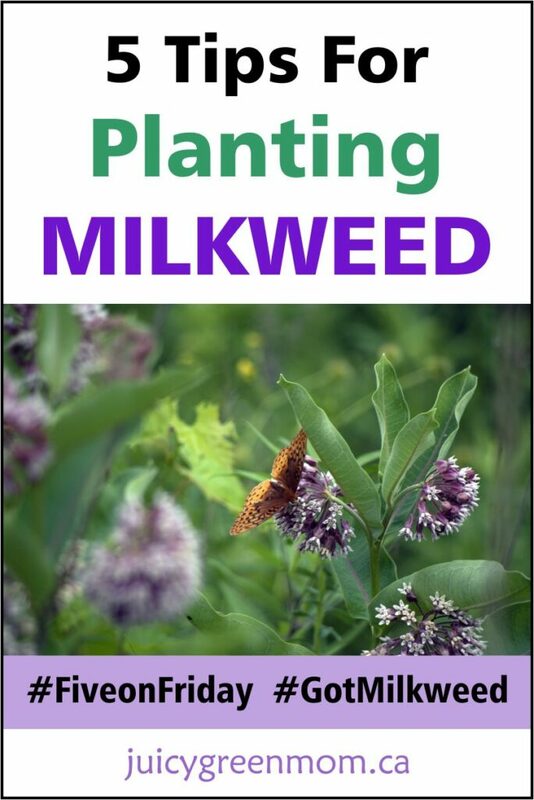 Here’s a great guide for how to plant your milkweed seeds! Will you plant some milkweed this year? Wow, I thought milkweed and monarchs was just an Eastern Canada thing. Yeah – it’s an all over North America thing! I planted 22 containers full of milkweed seeds, (half collected from native plants, half purchased seeds.) on Superbowl Sunday. Placed them all outside as mini greenhouses with simple saran wrap doubled and taped with strapping tape for lids, for winter stratification. I cannot wait to see it bloom, and better yet, see the butterflies and their eggs/caterpillars! Thank you for sharing!! That is so incredibly exciting!! I would love to see photos of your butterfly gardens! I did the same on January 1st. I winter sowed common milkweed and the orange butterfly weed in milk jugs. I live in Wisconsin. I hope the do well. That’s great! Excited to see how they do! I find that once they start growing, they really get big! I’ve had success with full sun or part sun! So wonderful to hear that you are doing this! There is a site online where you can get free milkweed seeds. I live in nova Scotia what type do I need . I’m not sure exactly what type you’d need in Nova Scotia, but I would google to see what works in your zone! The David Suzuki Foundation sells milkweed seeds seasonally, so that might be a good resource for you to see what might work best.